A saw set up with a diamond cutting blade to cut concrete slabs and bitumen pavements. Pavement saws come in many sizes and this one is at the smaller end of the scale. It is slowly lowered into the work and then slowly pushed forward by the operator. 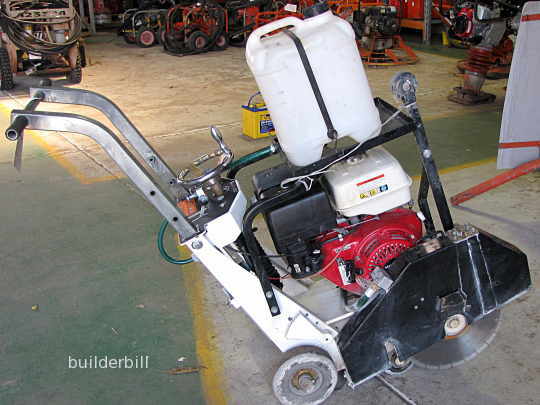 It is ideal for cutting straight lines in bitumen road surfaces. One of it's other uses would be cutting weakened plane joints in freshly set continuous concrete slabs. All of these saws work better with water cooling the blade and most of them have a facility for connecting the saw to a garden hose or have a self contained water tank as in the photo above. This machine is not big enough to cut straight through a 100mm concrete slab. For that sort of work saws with blades of 600mm and over are used. The large ones are always self propelled. The close up above is of the edge that does all the work. It is a matrix that has diamond dust embedded into it. There is a little known rule for operating any type of diamond tool edged tool like this. If there are sparks coming off the blade then the saw is not working correctly. It is a sign that the diamonds are being wasted. Mostly it is because the operator is pushing the saw too fast. In this case slow down and let the saw work. Otherwise there is not enough water so increase the water supply. On larger machines that are capable of cutting through reinforced concrete slabs, then from time to time the saw will cut through rebar and give off sparks when it does this. This is unavoidable of course.